Mozilla changed the number of content processes that the Firefox Nightly browser uses recently. The organization increased the number of content processes from four to eight in the browser. The Firefox web browser uses multiple content processes to improve stability and security. Websites and services that are opened in Firefox are automatically assigned to a content process. Multiple independent sites share content processes in Firefox which is different from Google Chrome which uses one process per site. Both methods have advantages and disadvantages. The use of fewer content processes reduces the RAM usage that each content process adds to the overhead but it is better for stability, security and privacy if sites are put into individual processes. Mozilla launched the browser's multi-process architecture in 2016 in Firefox Nightly and enabled multiple content processes in Firefox 54 Stable. Tip: All supported versions of the Firefox web browser come with a setting to change the number of content processes used by Firefox. Firefox Nightly users who check the number of content processes may notice that Mozilla bumped the number from four to eight in a recent update. Load about:support in the browser's address bar. This opens a troubleshooting page with lots of information about the browser. Scroll down until you find Web Content Processes under Application Basics. The value lists the number of active content processes followed by the maximum content processes. Load about:config in the browser's address bar. This opens the advanced configuration of Firefox. Confirm that you are careful if this is your first time opening the page. The value that you see listed for the preferences is the maximum number of content processes that Firefox supports. Mozilla plans to run additional test to get more data. Initial measurements showed an increase of about 40 Megabytes of RAM per process based on that. Depending on how tests go, Mozilla may increase the number of content processes in Firefox Beta and Stable eventually as well or keep the current number of content processes instead. Firefox will use more RAM if Mozilla goes ahead with the change. Users who do not mind editing config entries may test the change right now in Firefox Stable to see how the content processes increase affects RAM usage on their devices. I changed the number of content processes in Firefox ever since Mozilla unlocked that option to eight and had a great experience with that value. I have to admit that I did that on a system with plenty of RAM (32 Gigabytes) and that mileage may vary if the computer has 4 Gigabytes or even less. Mozilla could consider adjusting the number of content processes based on a device's RAM. Interested users can follow development on Bugzilla@Mozilla. Firefox Stable will use up to eight content processes as of Firefox 66 instead of just four content processes. Now You: How many content processes is ideal in your opinion? Mozilla changed the number of content processes that the Firefox Nightly browser uses recently from four to eight to test the new setting. At this moment, if computer has a lot of RAM, then 8 content processes is OK. But some users have only 4 GB RAM or less and they are opening just few pages. In this case default number of processes should be 1-2. I understand 3/8 means 3 processes used out of 8 available. On my PC I have 5/4; what does that mean? @klaas, 5/4 would mean that your browser handles more content processes than what it’s been told to. Stunning indeed. @Tom Hawack: hey Tom, long time no hear. Yes, strictly based on the numbers that’s what it means. But what does it mean in practice because logically that would not be possible. In about:config the dom.ipc.processCount = 4. @Klaas, maybe related to more than one window, but then you’d have to have 5/8 … if … by the way I still don’t know if the content processes refer to all opened Firefox windows or is it a per-window setting : if I have dom.ipc.processCount = 4 and two Firefox windows opened, is it 4 per window or 4 for all windows? @Tom Hawack: thanks for your reply. I understand you are somewhat in the dark about this processes aspect, as a lot of people must be. Maybe someone else will be able to shed more light on it for us. As far as I can tell, when Firefox AND a new window are open they both share all the processes up to whatever the maximum is set to, a certain number of tabs will need to be opened to reach that maximum process count. But then, if Firefox is opened with two different profiles, each profile will use its own separate processes, in my case that would be up to 6 web content processes for each profile. In about:config the “dom.ipc.processCount” is just whatever the user chose to set it to with the default being 4. In Nightly I can actually set “dom.ipc.processCount” as high as 12 but more than that doesn’t change the process count. 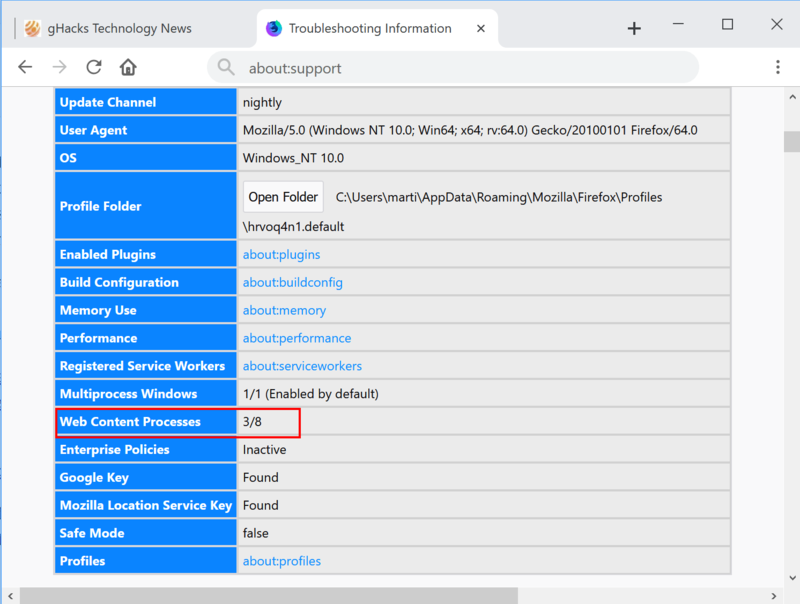 With 12 web content processes I saw a total of 15 processes in the Windows Task Manager. Anyway… “dom.ipc.processCount.webLargeAllocation” is still a mystery, to me anyway. @Richard Allen: thanks for your input. I always only have 1 Firefox window open, and usually no more than about 5 tabs, occasionally about 10. So, 5/4 is still a bit of a mystery, but I am not bothered in that I have not observed any unusual behaviour. By “default”, my install of WF will open one tab using 4 content processes in the Windows Task Manager. If you want it to open up using 5 processes like FF does you can change “dom.ipc.processPrelaunch.enabled” to true which is the default in FF. It won’t change the total. I shouldn’t have called the “processes” in the Windows Task Manager “content processes”, it’s confusing enough as it is. and 2 web content processes. When a 2nd and 3rd tab are opened then more content processes will startup reaching the default of 4 [web] content processes in FF. Yes I have WF installed, and while it was my primary browser, I demoted it to secondary a few weeks ago after switching back to FF after something like 6 years. I only have 1 profile each for FF and WF. So, I can confirm that the 5/4 really is on the Firefox about:support page. Today I even uninstalled WF. I also increased the number of processes in FF to 6, but did not see any real change, probably because I usually have a small number of tabs open. So I changed it back to 4. In any case, I don’t think it is worth spending more time on the 5/4 issue because I have not noticed any unusual behaviour by FF. Once webrender is enabled I’m curious what your result will then be with performance. Have you tried opening in safe mode from the about:support page, “Restart with Add-ons Disabled…” to see if you still see the 5/4? If you do and see no change I would be surprised if a clean install wasn’t what was needed to fix whatever is wrong. Did you start with a clean install when FF updated to Quantum? Anyway, I’m bummed you’re seeing that in FF and that I couldn’t reproduce it on my end. @Richard Allen: 1 thing I have not mentioned: I am using FF portable. Normally that should not make a difference, I would have thought, but maybe in this case it does, somehow. And I started using FF again with version 62.0.2, while versions of 6 years ago were on a different PC. As for webrender, please excuse my ignorance, but I have no idea what that means, how to enable it, and what the advantage of it is. Most people probably don’t know much of anything about webrender, it’s still in development. Webrender is a new renderer for Servo (browser engine) and will mostly be used to speed up cpu paint times, frame rates for scrolling and transitions, making everything smoother and faster. The goal is for 60 fps which is kind of a big deal. Right now Nightly v64 has Webrender enabled for some Win10 users that also have a Nvidia graphics card. I’m on Win7 using a Nvidia graphics card but I’m not seeing any improvement if I manually enable it. But, I am still seeing frame rates in the mid to upper 50s in both Nightly and FF, without Webrender. I’m guessing Webrender will be released with FF v65, maybe. I don’t really know if it’s going to be available for everyone. @Richard Allen: I use FF portable on my laptop, never use any programs on a USB. I daresay that performance of portable is similar to the installed version, which I base on my experience with a number of other progs I started using the portable version of, then switched to installed. Having said that, maybe that does not apply to FF, but I am happy with its performance as portable, and at least I don’t have changes made to my registry. I don’t use FF Nightly because I am not a great tinkerer. I do a bit here and there but nothing spectacular. At the end of the day a browser is just a tool for me that I want to work. I have tweaked a fair amount in about:config, and have 16 extensions installed, incl. Privacy Possum and uBO. I’ve kept the default 4 content processes after having tested 7 without any noticeable difference, but maybe is this related to my system’s cpu? I’ve read contradictory comments regarding the system’s cpu impact on the effectiveness of the number of content processes, some stating that it is limited by the cpu’s power. In my case, that of a simple duo-core processor, I linger to know if anything above 4 content processes makes any difference, actually. Whatever, number of content processes on Firefox means number of handled tabs. Second wondering : how are those tabs managed? If I have 10 tabs opened those handled by the multiprocess are limited to my content process number, right? But which tabs? The last 4, the first four opened? In other words I use a browser’s feature with a substantial deal of ignorance. There is an Addon for Chrome and Firefox which REALLY fixes that. watch 1080p Videos without Buffer or Stutter at all, ^^. Here are our h264ify reviews for Chrome and Firefox. I’ve set that to the number of my cpu threads (12). It’s currently using 13 out of 12 available processes. Funny. I’m just not seeing multi-process being slower, in any way, when compared to using a single multi-threaded process. What a bunch of nonsense. Although coming from Moonchild it does not surprise me. I don’t understand how anyone can swallow what this guy says. Oh my god it works ! I… will… install… palemoon… now ! Gnnnnh ! 8 web content processes for those using a “dual core dual thread” processor seems high to me. But then, chromium browers use a process for each tab and each extension so the process count can be high and “performance” is pretty good on my old laptop with a Core2Duo so who knows, maybe I’m just not looking at it right. According to FF’s data report 66% of FF users are using dual cores, I wish it also showed the thread count but I didn’t see that info. In Nightly, I saw 16% more system memory being used and 12% more graphics memory used when opening 12 tabs with 8 content processes versus using 4 content processes. Needless to say memory use will be higher. Just so everyone is clear on it, whatever number is used in the preferences you can add 3 to it to get the number of processes that will be seen in the Windows Task Manager, once enough tabs are open (3-8). Add 3 if you have extensions installed, without extensions it will likely be 2 that needs to be added to the total. I’m using 6 “content processes” in FF with addons installed, once I open 5 tabs I’ll see 9 processes in the Windows Task Manager. Appreciate the info. Looks like they’re making progress.